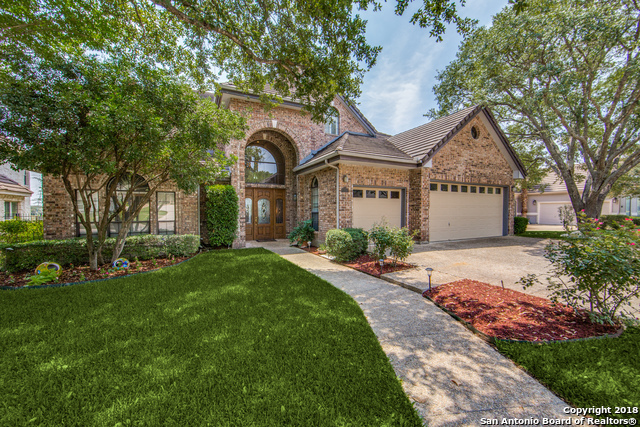 All SONTERRA THE MIDLANDS homes currently listed for sale in San Antonio as of 04/24/2019 are shown below. You can change the search criteria at any time by pressing the 'Change Search' button below. "Gorgeous custom home set on golf course fairway #4 in Sonterra. Versatile 5 bdrm home features dual mstrs, a guest suite down, ofc/craft rm & gamerm w/built-ins & wet-bar! Elegant hardwoods lead to open living w/high ceilings & corner FP. Entertainers dream island kitchen w/granite, bkfst bar, lots of cabs & plantation shutters in bkfst area.Plush mstr down w/corner FP, sitting area & spa-like bath w/sep granite vanities & lg shwr. Enjoy one of several cov'd patios upstairs & down overlooking lu"
"5BRs/4BA*GATED GUARDED Community*FENCED IN POOL*4 Sides Stucco*TILE Roof*HUGE BRs*Walk-In closets in EVERY BR*3 BRs have FULL BATHS*Secondary BR DOWNSTAIRS w Window Seat and Full Bath*GRANITE, Island in 22 FT LONG Kit*34 FT X 16 FT Liv Rm w Bay Window*CERAMIC, MARBLE and WOOD FLOORS, NO CARPET*Master BR Has 15 FT X 10 FT CLOSET w 80 LINEAR FT OF SHELVING-JACUZZI TUB-Glass Shower-Sep Vanities-TWO CFs-Bay Window*TWO Stairway accesses*Water Softener *32 FT LONG Cov Patio*FP*CENTRAL VACUUMING*Kit op"